Day Bed in Sunroom: Twin Bed Sleeps One (1) (No window coverings here, don't want to compromise that view!) Ideal for daytime lounging. Welcome to Casa Seabatical-NEW to the rental market! 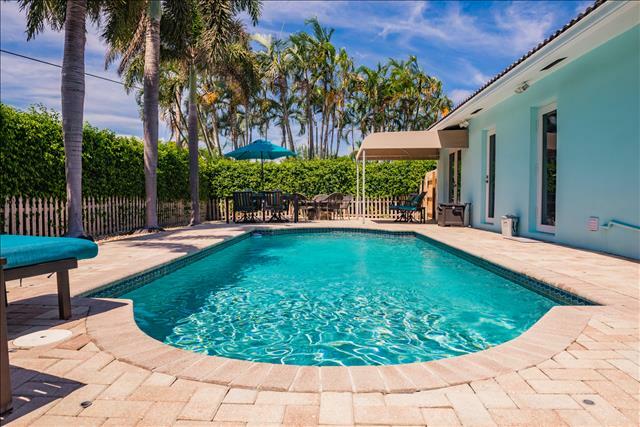 By The Sea Vacation Villas Management is pleased to offer this exceptionally private, 5 Bedroom, 3 Bathroom, Ocean Access, Intracoastal Waterway (yes… the views are simply breathtaking) Heated Pool, Beach Home, getaway to the luxury vacation rental market! 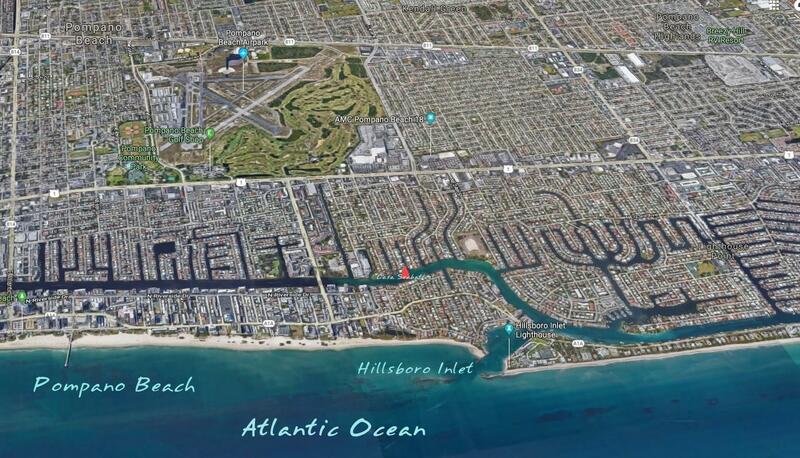 Casa Seabatical is situated in the picturesque, seaside, community of Pompano Beach. Pompano Beach is less than 1 mile away and has been newly renovated and offers the newest updates to any beach in South Florida. 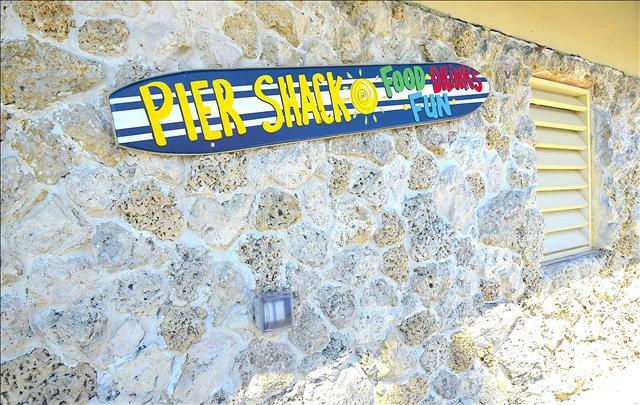 There is a beautiful new restaurant on the Pompano Beach Sand with breathtaking views for an afternoon lunch or early evening dinner. Upon entering Casa Seabatical, you are greeted by a spacious foyer entryway that leads to a ground floor Master Bedroom #1 with (King bed) and LED High Definition television. This bedroom has an en-suite full bath and amazing views of the waterway and pool area. There is another bedroom on the ground floor with bunk beds (Full and Twin). This layout is perfect for privacy between two families. 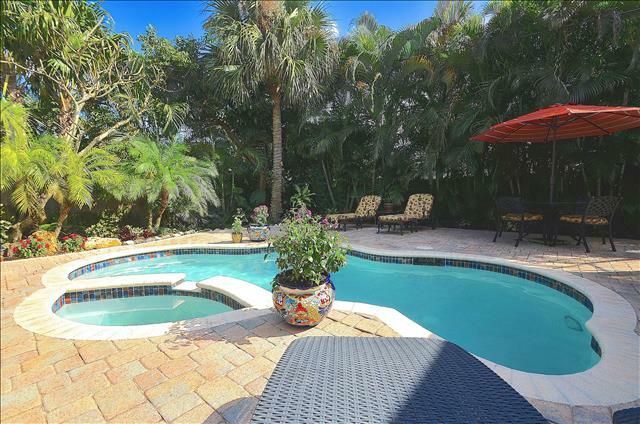 Continue upstairs, this a two-level, single family home, a spectacular open floor plan featuring direct, unobstructed, views of both the heated pool lounge area and the ocean access Intracoastal waterway. The main living area is both comfortable and spacious with vaulted ceilings, offers lots of windows & doors overlooking the heated pool and Intracoastal waterway and is equipped with one (1) large sectional size leather sofa, and a 65 Inch LED 4K High Definition Television. The updated kitchen, with custom white Shaker style wood cabinetry, beautiful new White Stone Countertops, stainless appliances and newly tiled floors is fully equipped with everything you will need while on vacation (glasses, coffee mugs, dishes, silverware, pots & pans, toaster, coffee maker, a blender for Margarita’s!!! etc.) and only requires you to bring food, beverages, and condiments. There is a breakfast bar with seating for four (4). The open formal dining area offers seating for Six (6). Together Seats Ten (10) for meals. In addition to the main living area, Casa Seabatical offers a comfortable Sunroom area with a twin size day bed and separate comfortable reading lounger. Should you be required to catch up on some work while on vacation (hopefully you do not; however, should the office call), there is no need to worry, as Casa Seabatical is equipped with WiFi throughout the home and a work desk in the Sunroom. The Sunroom offers the best views in the house! Watch mega yachts go by while sipping an afternoon cocktail in the A/C Sunroom. Off the Sunroom and the Dining area you will find glass doors leading out to a balcony. There are chairs on the balcony and spectacular views of the water. The upstairs Master Suite #2 (King Bed) is exceptionally private and features an en-suite full bath and granite counter top makeup counter. The master suite offers two nightstands, a full-size dresser, a LED High Definition television and an en-suite, full size, bathroom equipped with a shower and a walk-in closet. Bedroom #4 (King Bed) is both spacious, private and offers two nightstands, a tall dresser and a LED High Definition television. Bedroom #5 (Queen Bed) offers two-night tables, a full-size dresser, and a LED High Definition television. Casa Seabatical’s Private Heated Pool & Lounge Area is the perfect place to spend time with family and friends. 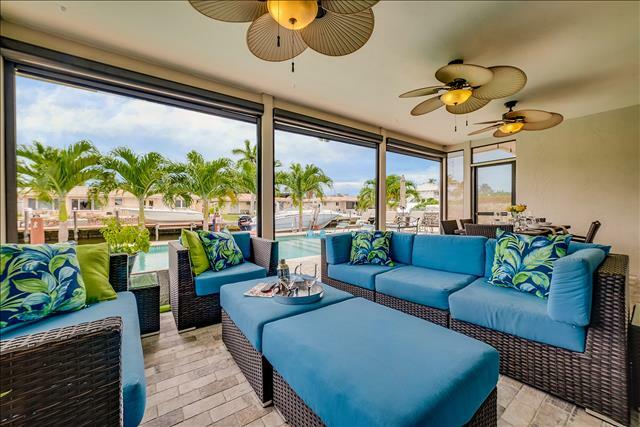 The lounge area offers a completely covered lanai with outdoor wicker love seats and chairs. Dining for Eight (8) on the pool deck and features poolside chaise lounge chairs overlooking the waterway. The pool deck area is equipped with a new stainless propane BBQ. As previously stated, another spectacular feature that sets Casa Seabatical apart from virtually all other vacation homes is the fact the property comes with a priceless water view. 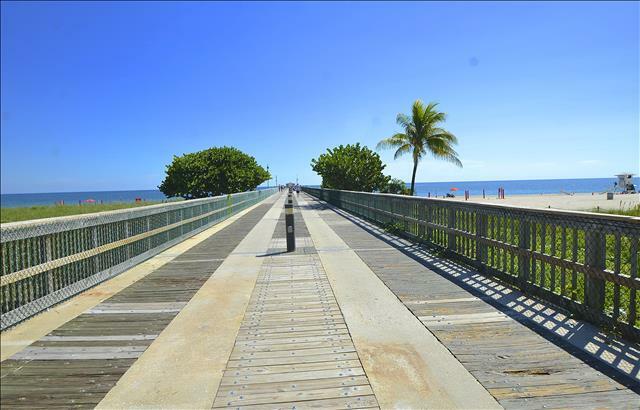 You do have the option of driving to the newly renovated Pompano Beach where there is plenty of parking in the new parking garage or beach lot. The drive is less than five minutes and, should you be required to carry a large number of items to the beach (trust us... we know), it is better to drive. 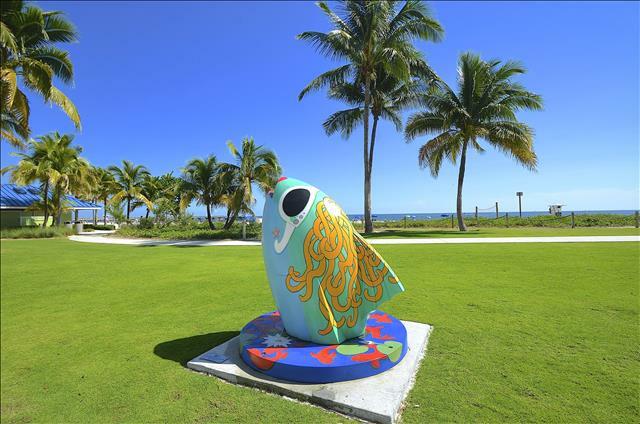 Unlike Ft. Lauderdale and LBTS beach this beach now offers new restrooms, BBQ picnic areas, new outdoor exercise equipment circuit, new children's playground, new snack shacks, new “Beach House” restaurant, grassy live music area etc. Best of all, its all located on the sand and oceanfront. 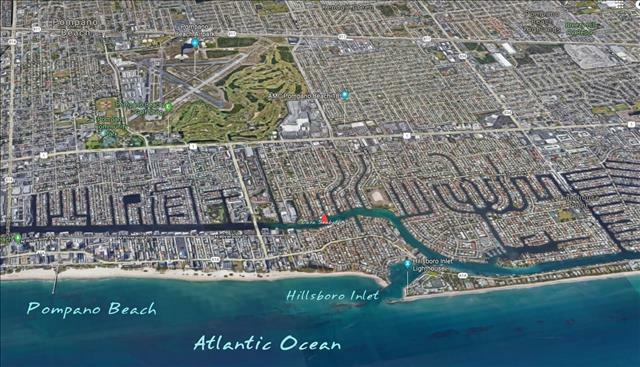 The home is less than a mile to shopping mall, first class restaurants, Whole Foods, Beach etc. 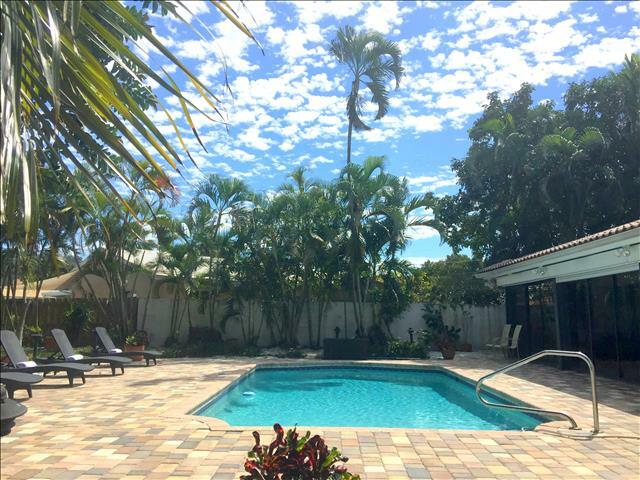 Casa Seabatical is a wonderful destination for individuals and families in search of a relaxing getaway with the convenient accessibility to the beach and everything the Greater Fort Lauderdale / Pompano Beach areas have to offer! Casa Seabatical is fully equipped with wireless Internet and cable television service. The home also provides additional linens, pillows, and towels. An air mattress, pack-n-play, high chair, and stroller are available upon request for $30 per stay. 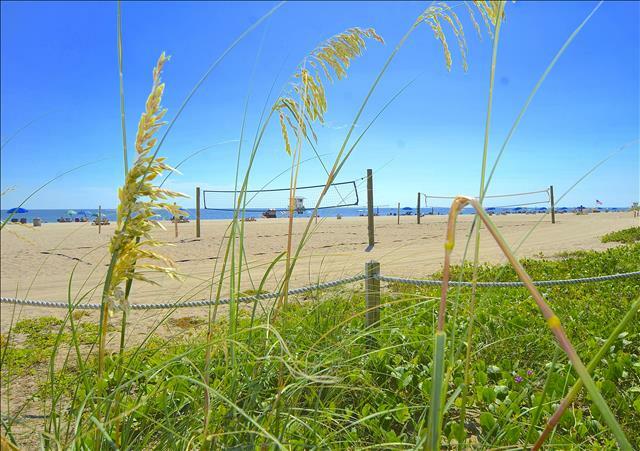 Please inquire with the management staff at By The Sea Vacation Villas for details. Casa Seabatical has a usable boat dock, please inquiry for details and pricing. Take advantage of introductory rates! **Availability shown on the calendar may not be accurate due to computer interface technicalities. Please call our office to confirm availability. “My family and I stayed for a week (July, 2018) and we loved the home. It was one of the best vacations within the US that we've taken. We often travel overseas and this time around made the decision ...read more. Pictures are sometimes misleading on vacation home sites and the home does not live up to expectations. Not so with Casa Seabatical! We found the home lived up to the pictures and description on the s...read more. We enjoyed the stay very much. The house was perfect and if we decide to come back one day we would not hesitate to rent it again. So much better than staying in a hotel. Thank you for your cooperatio...read more. 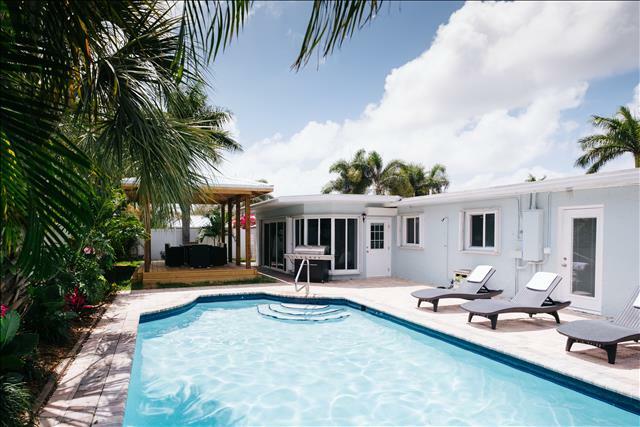 “You can expect a beautiful vacation home"
You can expect a beautiful vacation home with all the amenities to have a pleasant time with family or friends. You will not regret it! This was an excellent vacation home!! The house provided everyt...read more. Beach Chairs and Beach Towels included. Some pool toys too! A minimum stay of 2 nights required during standard rental dates. All currencies are shown in USD. Reservation requests are not considered confirmed until a guest receives an order acceptance letter by email and the first payment is made. We reserve the right to refuse any order request if we have not taken payment yet. A Minimum Stay of Seven (7) Nights is required if you only stay through one holiday. There is a 14-day minimum if your stay will cover two holidays such as Christmas/New Years. Coupon codes may only be applied to new reservations. No price adjustments will be made for existing reservations if a coupon code becomes available after the booking is completed. We accept credit cards by phone or in person (not on our website). Please call us to make payment arrangements after you have placed an order request on our website and your order has been accepted. A government issued photo id is required to pay with credit card. Checks must be payable in US funds and drawn from a US financial institution; otherwise any bank fees to convert funds to US funds will be guests responsibility. Please call us to make payment arrangements after you have placed an order request on our website and your order has been accepted. No check-ins allowed on the specific holiday-day for example- Thanksgiving day, Christmas Day, New Year's Day, Easter Sunday, July 4th and Labor Day. The check-in days must commence before or after the holiday so that our staff may celebrate too. The remaining Balance of 50% of the total Rental Cost is due Sixty (60) Days prior to arrival. Renter must provide a credit card and driver’s license at check-in. Renter must agree to a $1000.00 pre-authorized credit card security deposit hold. This is not a charge. It is a verification of funds and your bank will hold available credit back from use. The authorized credit card hold will be processed on check-in day or prior to the renter's arrival. Your bank will hold the funds for a period of thirty (30) days and will automatically release them back into your available credit, if we do not place a claim. In the event there are incidental utility charges or damage to the property we reserve the right to claim the Security Deposit. We will not include this amount in the total rental charges since it is initially just a hold and not an actual charge. We do not guarantee or allow early check-in's requests. All locks are time sensitive and will not give you access prior to 4:00 PM. Guest should not expect to take occupancy sooner than times stated. Sometimes if a home becomes available early we will call or text you but no guarantee. If you do not receive an early call then proceed to the home at 4:00. Please note that the 4:00 check-in is not always guaranteed, in some cases check-in may be delayed due to circumstances beyond our control. Rate adjustments credits cannot be made for late check-in or early departure. We will text or call you if we have changes in check in times. You may request a late check-out in writing via email one day prior to check out. Based on availability we may grant your request in writing via email. If you do not receive a written confirmation allowing a late check out via email, then it is unauthorized to stay late. Verbal commitments will not count. If you stay later and it is unauthorized, you will be asked to leave and will be charged a full day rate on your security deposit hold for failure to vacate. Please inquire with management for details involving pets. Not all vacation homes accept pets. We reserve the right to individual policies and fees. 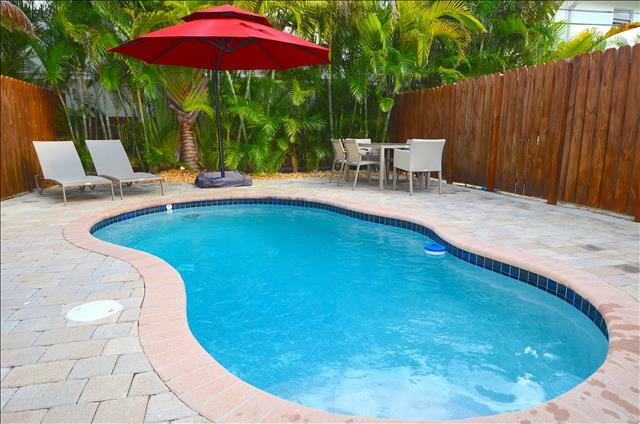 The rental property owner or rental property association controls pool temperatures. By The Sea is not responsible for pool or spa temperatures, closures or malfunctions. No credit, discount and/or rate adjustments can be granted for items mentioned above or circumstances beyond our control. There will be days when the weather conditions will not allow pool heaters to accommodate swimming and temperature recovery times will vary. All sales are final. No refunds will be issued. If your rental is more than 120 days away then you may request for us to release the dates and try to re-book. If we book for the same dates and rate, then we may choose to issue a refund minus a cancellation fee. A partial refund may be applicable for the same dates booked at an adjusted rate. These circumstances are at management’s discretion depending on the situation. We recommend optional trip insurance that can help to protect guests from unforeseeable circumstances that may be a reason for cancellation. 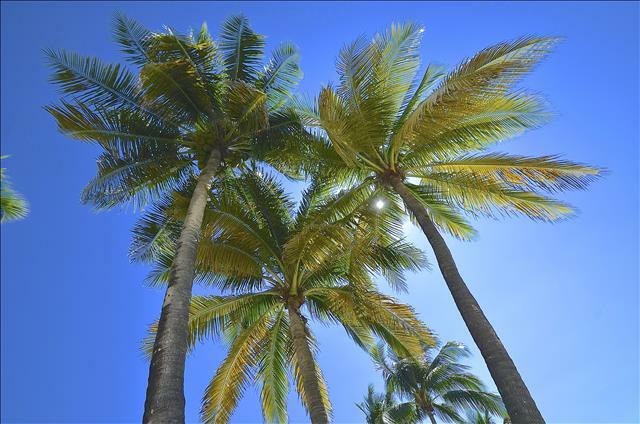 We can refer guests to an authorized trip insurance company. All cancellations must be made in writing to be binding. All agreed cancellation refunds will be sent in check-form, less administrative fees, 2 weeks after the initially scheduled rental start date. By The Sea Vacation Villas reserves the right to move, relocate, reassign or change the rental property noted on the rental reservation for unforeseen circumstances. By The Sea Vacation Villas will make every effort to re-book the guest in a like and kind or upgraded rental property. Under no circumstances does the rental confirmation guarantee the rental property selection or assignment. If Guest does not wish to relocate or accept the alternative accommodation By The Sea Vacation Villas will issue a full refund to the Guest or pro-ration if during occupancy in the event the property is unavailable or becomes unavailable due to maintenance or otherwise. Under no circumstances will By The Sea Vacation Villas be liable for any other charges incurred for property moves or cancellations. We can not honor requests by guests to switch units because they are unhappy with decor or location. Units are not owned by management and each unit is individually owned. We can not grant transfer requests without an owners approval. The information contained on this website and our advertising portals, is accurate but not guaranteed. 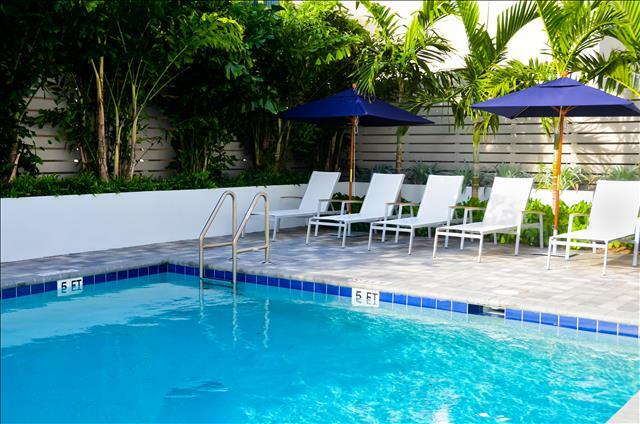 Descriptions, rates and property amenities listed are subject to change without notice. Omissions, additions or errors as well as changes in property bedding, furnishings, equipment, etc., shall not be the responsibility of By The Sea Vacation Villas, owner, or agent. 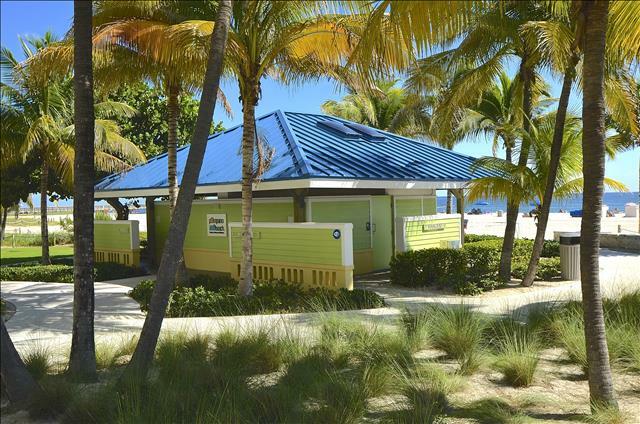 Guests are required to check with By The Sea Vacation Villas about specific items of importance to them. Your rental agreement will be construed under Florida law and the sole venue and jurisdiction shall be the Courts of Broward County, Florida. All disputes between By The Sea Vacation Villas, owner, or agent and the guest based on the rental agreement or its breach will be mediated under the rules of the Florida Bar Association or other mediator agreed upon by the parties prior to filing any civil suit. Mediation is a process in which parties attempt to resolve a dispute by submitting it to an impartial mediator who facilitates the resolution of the dispute but who is not empowered to impose a settlement on the parties. The parties will equally divide the mediation fee, if any. In any litigation based on this Agreement, the prevailing party will be entitled to recover reasonable attorneys’ fees and costs at all levels. By signing the rental agreement Guest agrees to work amicably and diligently with By The Sea Vacation Villas, owner, or agent in resolving any deficiencies before during and after the guest stay. Prior to any credit card dispute, filing of any online review or regulatory complaint the guest agrees to notify By The Sea Vacation Villas, owner, or agent in writing and allow By The Sea Vacation Villas, owner, or agent a process of good faith negotiations with management in an effort to allow By The Sea Vacation Villas,owner, or agent opportunity to maintain good customer relationships. Guest complaint investigations may take over 30 days before they are resolved and before a refund may or may not be granted. In consideration for the use of the rental property and the other terms and provisions of this confirmation, Guest agrees as follows: (i) Neither By The Sea Vacation Villas nor any of By The Sea Vacation Villas agents, officers, directors, shareholders,employees, or other representatives (hereinafter, collectively referred to as the “By The Sea Vacation Villas Parties”)shall at any time be liable or responsible in any way whatsoever for any loss,injury, death, or damage caused or arising in connection with the Guest’s(including members of Guest’s travel party and any visitors or invitees of Guest) use or occupancy of the rental property or any of the amenities, or as a result of acts of god, acts of government or other authorities, wars, civil disturbances, hijacks, thefts, or any circumstance beyond its control; and (ii)Guest with the intention of binding itself, its successors, legal representatives, directors, stockholders and/or assigns, as the case may be,hereby releases and forever discharges each of the By The Sea Vacation Villas Parties, and indemnifies and holds the By The Sea Vacation Villas parties harmless,from and against any and all liability, damages, actions, causes of action,claims, losses and/or expenses (including but not limited to attorneys’ fees,court costs and expenses) (hereinafter collectively referred to as “Losses”),arising in connection with or based on injury to or death of any person, or damage to property, including the loss of use thereof, caused in whole or in part by Guest or any member of Guest’s travel party, including without limitation visitors or invitees of Guest, regardless of whether or not caused in whole or in part by the negligence of one or more of the By The Sea Vacation Villas Parties; provided, however, this indemnification shall not apply with respect to losses arising directly from the willful misconduct of any one or more of the By The Sea Vacation Villas Parties. To check availability and book this rental online, choose your check-in and check-out dates by clicking them on the vacation rental calendar. After choosing your dates you will be transferred to our secure online booking system to place your reservation in a few easy steps. You will receive detailed pricing and be able to revise your reservation as needed.